« Will Majella Leave Daniel O’Donnell? Here’s a look inside the current talk of the Irish town, Kansas City’s newest Irish pub, Waxy O’Shea’s in Shawnee, Kansas. The photo was taken pre-opening so you can have a good view of the carpet. Waxy O’Shea’s Irish Pub is the cover story on this month’s Midwest Irish Focus with a picture of the proprietors Lee Sanford and Bob Ridenhour in the pub behind the pumps (Guinness, Smithwicks, Harp, Bass, and special edition “Guinness 250″ among the beers pictured). The August issue of the Focus is available on newsstands all over the Midwest this weekend. This will be seen in items like the restaurant’s bar, made in Ireland, and artistic floorwork. Irish music will be played at all times, with live Irish music on the weekends and Ceilidhs, traditional Irish folk music events pronounced “kay-lees,” on various Sundays during the year. The menu will have some American fare, but also will feature corned beef and cabbage, fish and chips, shepherd’s pie, bangers, black and white pudding and boxty sandwiches, made with Irish potato pancakes. I really like the story where Sanford said both he and Ridenhour, residents of Johnson County, drove by the Shawnee building for years on their way to their Irish pub in Branson, Missouri called Waxy O’Shea’s, always thinking it looked perfect for a pub and then they found out it was available so chose to open another Irish pub, another Waxy O’Shea’s. Everyone should do things like that. This entry was posted on Saturday, August 1st, 2009 at 9:59 am and is filed under 1-eolai, Midwest Irish Focus, Photos, Waxy O'Shea's Shawnee. You can follow responses via my RSS 2.0 feed. Both comments and pings are currently closed. 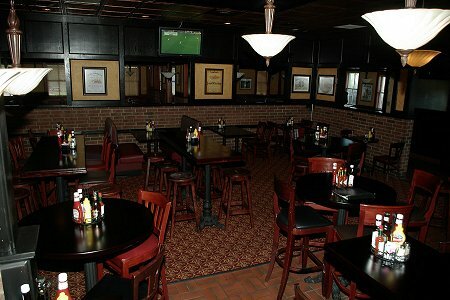 Several co-workers & I have started making Waxy O’Shea’s a regular lunch spot! The food & service has been wonderful! I hope you are around for years & years to come! Keep up the good work! service sucked real bad, food just ok.
Been there three time now and the food is great! 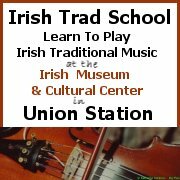 haven’t heard a single “Irish” tune come out of any band there yet, though (and yes, I’ve been there on weekdays and a weekend). I do like the menu and the bar, and will keep going in hopes of having a Guiness and listening to traditional music. Make sure you get on Waxy’s email list. Bands like mine, Kelly, who do play a lot traditional pieces play there quite often. In fact we’ll be there next Wednesday. Tullamore, Bob Reeder, $3 Band all play there as well and offer great and varing trad music. It’s great to have Waxy O’Shea’s in Shawnee.